“You’re on the Trail to Something Big” when you plan your trip to the Allegheny National Forest Region. 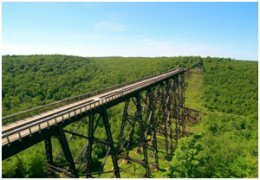 Visit one of the top 10 most beautiful skywalks and scenic vistas in the world – the Kinzua Sky Walk. 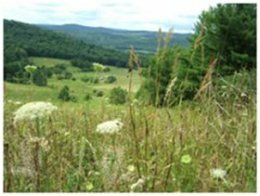 Enjoy the scenic beauty of the Allegheny National Forest Region along the National Longhouse National Scenic Drive and Pennsylvania Route 6. Fun activities such as guided hikes and baking with a pastry chef can be mixed and matched with your choice of attractions, restaurants and overnight accommodations to create fun memorable tours. Day use-park open from 8 am to sunset. Free Admission to the park and to walk on the skywalk. A new year-round visitors center is open at the Kinzua Bridge State Park with exhibits on the three E’s – energy, engineering and the environment. Groups are requested to pre-register. Options include a visit to the park with a walk on the skywalk, or a personalized educational program presented by park staff. Monday through Saturday: 8 am to 4 pm. 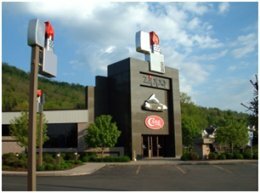 The Zippo/Case Museum features world-class interactive exhibits, an extraordinary 7’x 11’ American flag comprised of 3,393 red, white and blue lighters, and the famous Zippo Repair Clinic where the Zippo lifetime guarantee is fulfilled. 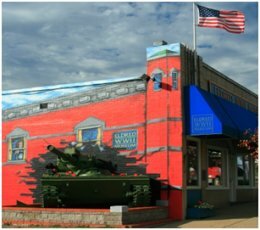 Designed to educate and awe visitors of all ages, this museum located in the small town of Eldred houses world-class interactive exhibits and artifacts from around the world. Personalized tours will be given by their knowledgeable curator who will customize the tour to your groups’ age & interest. Highlights include a M255 tank, a working submarine periscope, the Gallery of Valor, Jeep exhibit and tank mountain. Hear the “Wild Catting Tales” at the site of our 72 foot tall, 1890 Era Standard Rig. See yellowdogs and barkers, headache posts, hurry-up sticks and sucker rods. 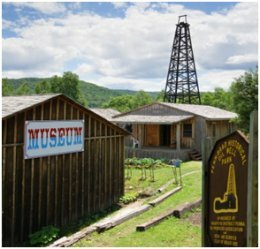 In 1881, the Bradford Oil Field produced an incredible 83% of the United States total oil output. Groups Welcome. Please call ahead to schedule motorcoach or student field trips. FALL REALLY IS BIGGER HERE! Chosen by USA Today as “The Most Scenic Byway in Pennsylvania,” the Longhouse National Scenic Byway circles the shorelines of the Allegheny Reservoir. 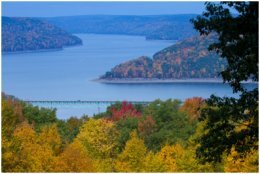 Viewpoints include Rimrock Overlook, Jakes Rocks, Kinzua Point and the Kinzua Dam. The eastern shoreline of this loop is easily accessible from Pennsylvania Route 6 just east of the village of Kane, via Route 321. 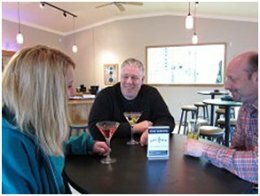 In Kane, a variety of locally owned shops and restaurants are experienced in working with groups including Flickerwood Wine Cellars and CJ Spirits Craft Distillery. Prime fall foliage is traditionally the first two weeks of October. An educational resource guide available. To arrange a short guided hike and ranger station visit call the Marienville Ranger Station at 814-927-5799. For tours at Kinzua Dam please call the U.S. Army Corps of Engineers at 814-726-0661. Tour multiple wineries and a distillery for a day of fun. The spirits of northwestern Pennsylvania’s first craft distillery can be enjoyed by scheduling a tour of the distillery with a tasting. Fashioned from the purest Allegheny Mountain spring waters and locally grown grains their craft selection of fine spirits include whiskey, gin, rum and Rocksov vodka. Order a tasting menu to complement the spirits or have fun and order one of their signature cocktails. A local favorite is their leek vodka Bloody Mary. Please call ahead to schedule your tour and tasting. Stop, shop, taste and tour. Guests are treated to a tour of the wine cellars along with a wine tasting from the large variety of award-winning Flickerwood Wines produced by the Zampogna family. 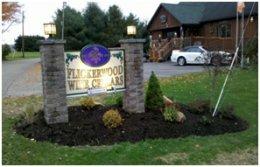 Flickerwood’s wine lounge has a warm welcoming atmosphere, they also offer a small wine-themed gift shop, and a selection of tasty menu items. Call for detailed information on scheduling your tasting tour. Ask about their menu for groups that wish to dine on site. A schedule of their seasonal festivals and evening entertainment is available on their website. 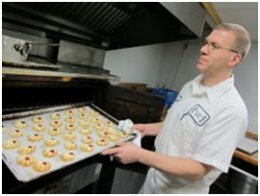 Bring your group to enjoy a hands-on experience baking a delicious pastry in the kitchen with pastry chef Joe Frombach at John Williams Pastry Shop. Half will be baking, while the other half enjoys a delicious luncheon. Switch places, then take your pastry treats with you on the bus! Restaurant Reservation. Groups, with advance reservations, may also book the restaurant for a breakfast buffet or luncheon at this family-owned restaurant for motorcoach groups. Outdoor seating in season. The pastry shop at the bakery offers fresh baked European pastries, decorated cookies, plus a variety of specialty loaves of bread for purchase. Two local favorites are Swedish Rye & Salt Rising Bread. Groups of 12 to 20. For smaller groups, or friends & families, book an evening baking with Joe in his kitchen creating delicious take-home treats. A fun idea for birthday parties, family get-togethers, and seasonal holiday baking. Create, bake and decorate your treats to take home. 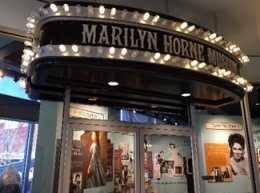 The Marilyn Horne Museum and Exhibit Center showcases highlights from the personal archive of legendary opera singer Marilyn Horne. Located in Bradford, Pennsylvania’s National Historic District, the 3,400 sg. ft. museum is housed in a six-story, circa 1932 Art Deco building. Collection highlights include costumes, interactive audio and visual exhibits, and a documentary film shown in a sumptuous theater designed to evoke the ambience of Venice’s famed Teatro la Fenice. Looking for something special? High Tea at Marilyn Horne Hall is the perfect afternoon for groups from 10 to 48 participants. The buffet-style event offers a traditional menu of high tea favorites. Dine in a private space while listening to a backdrop of classical music. Then join the museum’s docent for a presentation before touring the exhibition. Each guest receives a small gift before departing. Additional Information. Free motorcoach parking. Café and Gift Shop on-site. Downtown location near shopping, dining and lodging. Free Admission. Open year-round (excluding major holidays). The Allegheny National Forest Region offers a wide variety of professional theater, musical and artistic performances. The Bradford Creative Performing Arts organization presents a wide variety of national touring companies of professional artists and ensembles during their annual season at great ticket pricing. The University of Pittsburgh at Bradford Arts Program is the cultural and artistic hub of the region, offering plays, concerts, dance recitals and art exhibitions mostly held at the Bromeley Theater. Bradford Little Theater offers a range of scheduled performances and their talented cast will work with groups to schedule special performances for motorcoach groups. 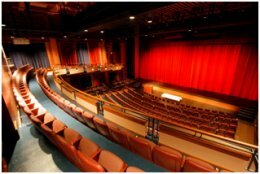 Make this your inexpensive cultural hub by staying over to enjoy the nearby theater and artistic entertainment. Check out the full listing of upcoming events by date. Take a walk on the wild side and see exotic animals like alligators, armadillos, turkey vultures, turtles, and snakes. 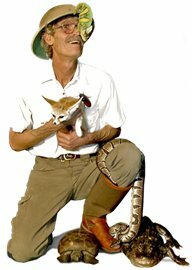 Bwana Jim has a rare gift for handling animals and shares his knowledge in an incredibly fun and entertaining way. Your group will love this enthusiastic, educational and witty show. Afterwards visit the Wildlife Gift Shop where Thumper the crazy cockatoo will greet you. Find exotic animal t-shirts, nature CD’s, and stuffed animals. 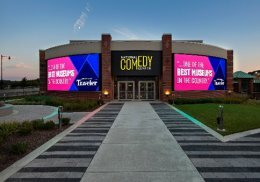 Comedy fans will enjoy the exclusive collections and world-class exhibits telling the virtual story of comedy in America. Visitors will go on an interactive journey through comedy history, from early vaudeville acts to the latest viral memes. Cutting-edge personalization technology makes the entire experience unique. Educational games and fun competitions, guests can step into the shoes of comedy pros, trying their hand at cartooning, comedy writing, live stand-up, and faux-pie fights. Pfeiffer Nature Center, 1974 Lilibridge Road, Portville, New York, has open access hiking trails, a historic log cabin, great birding areas, and a picturesque pavilion available for rent. Located in rural southwestern New York, the Center is located on more than 648 acres of rural landscapes among old growth forest. A variety of guided hikes and outdoor activities are scheduled throughout the year. The Woods, Walk & Trail Run is held every June. For a full list of scheduled activities please visit our website.